Dorothy Lam Build Confirmed for Weekend of Oct 16/17/18! This year’s Projects In Place build at Dorothy Lam Children’s centre has been rescheduled for Friday, Saturday and Sunday, October 16, 17 and 18th, 2015, and we’re looking for volunteers to help us build something special! Projects in Place (PIPS) and the Vancouver Society of Children’s Centres (VSOCC) are partnering again to upgrade a number of VSOCC’s children’s playgrounds to provide more natural environments; develop gardens for the children to grow food to be used in their daily meals; and implement a recycling and composting program. 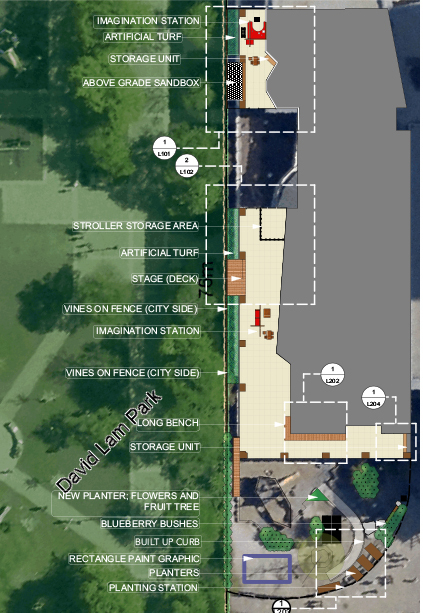 Dorothy Lam Children’s Centre is located next to the much loved David Lam Park and RoundHouse Community Centre, and helps make our downtown more family-friendly for its residents and provide much needed childcare services for families. Friday, October 16th is delivery day, where we will be unloading supplies and setting up for the weekend build. We will need a few helping hands Friday afternoon. Saturday, October 17th is Build Day #1, where we will be building planters, a sandbox, a stage deck, a bench, interactive playstations, fixing a pirate ship climber and painting. We will need a bunch of volunteers to help us build these, and a few team leaders with previous carpentry experience will be helpful. Sunday, October 18th is Build Day #2, where we are continuing Saturday’s projects, painting and planting to finish any last remaining items and making sure the children’s centre is ready for the kids on Monday morning! Note that we will proceed with the builds rain or shine (there will be protective cover on site) and that participants need to be at least 18 years of age.